Mr Lee, aged 91 passed away at 3:18am on Monday morning, 46 days after admission to Singapore General Hospital. Mr Lee was warded at SGH since 5 Feb for severe pneumonia and was on life support. 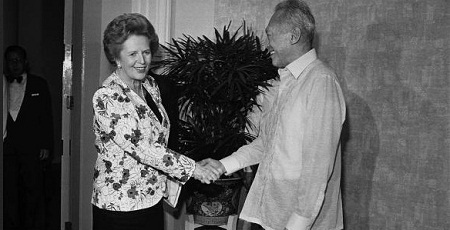 Prime Minister Lee Hsien Loong has declared a period of national mourning for Singapore's first prime minister Mr Lee Kuan Yew from today to Sunday (March 23 - 29). 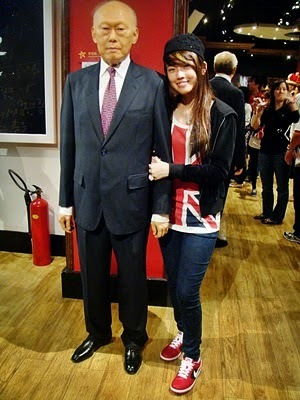 Mr Lee's body will lie in state at Parliament House from Wed to Sat (March 25 - 28). Those who wish to pay their respects can do so from 10am to 8pm daily during this period. A State Funeral Service will be held at on Sun (March 29), 2pm, at the University Cultural Centre, National University of Singapore. The service will be attended by the late Mr Lee's family, friends and staff, the President, Cabinet Ministers, Members of Parliament, Old Guards, senior civil servants, grassroots leaders and Singaporeans from all walks of life, said the statement. The state funeral will be followed by a private cremation at Mandai Crematorium. 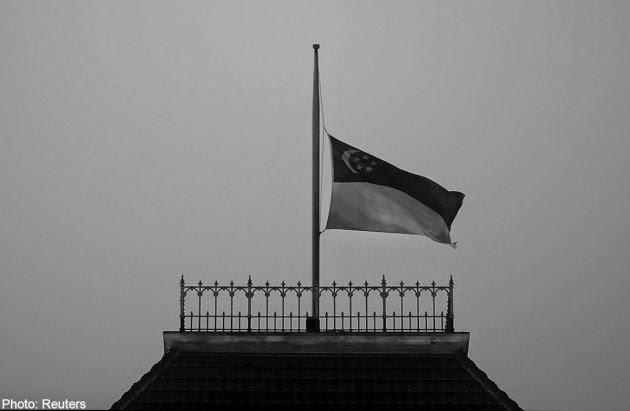 State flags on all government buildings will be flown at half-mast from today to Sunday as a mark of respect. Singapore's founding father Lee Kuan Yew, who will turn 90 next month, said in a new book published Tuesday that he feels weaker by the day and wants a quick death. "Some time back, I had an Advanced Medical Directive (AMD) done which says that if I have to be fed by a tube, and it is unlikely that I would ever be able to recover and walk about, my doctors are to remove the tube and allow me to make a quick exit," he wrote in the book "One Man's View of the World". The book is dedicated to the Asian statesman's views on international affairs but an entire chapter contains his musings on death, religion and other personal issues. The 400-page work is dedicated to his late wife Kwa Geok Choo, whose death in 2010 shattered the normally stoic veteran politician. "Some time back, I had an Advanced Medical Directive (AMD) done which says that if I have to be fed by a tube, and it is unlikely that I would ever be able to recover and walk about, my doctors are to remove the tube and allow me to make a quick exit," he wrote in the book "One Man's View of the World" published Tuesday. related: "One World's View Of The Man"
MANY WHO SUPPORT Terri Schiavo's threatened dehydration assert that removing a feeding tube from a profoundly cognitively disabled person results in a painless and gentle ending. But is this really true? After all, it would be agonizing if you or I were locked in a room for two weeks and deprived of all food and water. So, why should we believe that cognitively disabled patients experience the deprivation differently simply because they receive nourishment through a feeding tube instead of by mouth? Depriving food and water from profoundly cognitively disabled persons like Terri who are not otherwise dying, a process that causes death by dehydration over a period of 10-14 days. As I will illustrate below, this may cause great suffering. Not forcing food and water upon patients who have stopped eating and drinking as part of the natural dying process. This typically occurs, for example, at the end stages of cancer when patients often refuse nourishment because the disease has distorted their senses of hunger and thirst. In these situations, being deprived of unwanted food and water when the body is already shutting down does not cause a painful death. Advance Medical Directive (AMD) is not euthanasia or mercy killing. Euthanasia / mercy killing is the deliberate ending of the life of a person suffering from an incurable and painful disease by unnatural means, such as the administration of lethal chemicals. Whereas Advance Medical Directive (AMD) is a legal document you sign in advance to inform your doctor that you do not want the use of any life-sustaining treatment to be used to prolong your life in the event you become terminally ill and unconscious and where death is imminent. Lee has visibly weakened since then and revealed in the book that despite daily exercise and a disciplined lifestyle, "with every passing day I am physically less energetic and less active." "There is an end to everything and I want mine to come as quickly and painlessly as possible, not with me incapacitated, half in coma in bed and with a tube going into my nostrils and down to my stomach," he wrote. Elsewhere in the book, Lee addressed what he considers the biggest long-term threat to Singapore — its low birth rate — and rejected as “absurd” suggestions that his population programme in the 1970s urging couple to stop at two children contributed to the current situation. Despite a slew of so-called “baby bonuses” to encourage couples to have children, Singapore’s total fertility rate last year stood at 1.20 children per woman, far below the 2.1 needed to maintain the native-born population. If you do not sign one, they do everything possible to prevent the inevitable. Singapore's founding father Lee Kuan Yew has denied his policies were to blame for the city's low birth rate and said financial handouts for young couples would not solve the problem. In excerpts from a new book to be launched later Tuesday, Lee insisted that the reluctance of couples to have more children was the result of changed lifestyles and mindsets, which no amount of financial perks could alter. Despite a slew of so-called "baby bonuses" to encourage couples to have children, Singapore's total fertility rate last year stood at 1.20 children per woman, far below the 2.1 needed to maintain the native-born population. I wouldn't call myself an atheist. I neither deny nor accept that there is a God. The universe, they say, came out of the Big Bang. But human beings on this earth have developed over the last 20,000 years into thinking beings and are able to see beyond themselves and think about themselves. Is that a result of Darwinian evolution? Or is it God? I do no know. So I do not laugh at people who believe in God. But I do not necessarily believe in God - nor deny that there could be one. I wish I can meet my wife in the hereafter, but I don't think I will. I just cease to exist just as she has ceased to exist - otherwise the world would be overpopulated. Is heaven such a large and limitless space that you can keep all the peoples of the world over the thousands of years past? I have a large question mark on that. Q: How often do you think of Mrs Lee? Unexpectedly, Lee Kuan Yew rose to speak. He insisted on making his way, somewhat unsteadily, to the rostrum, waving away the microphones that were brought to him. 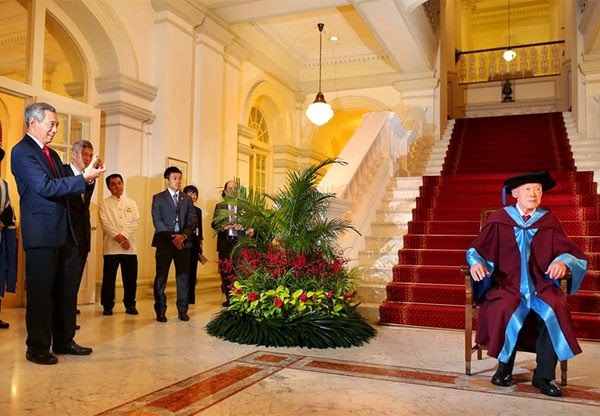 Once there, he stood silently for a moment, gazing into the crowd gathered at the Istana. "Old friends," he said, finally. "Thank you for coming. Thank you for making time to attend my book launch." 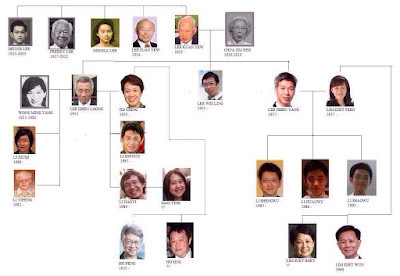 Looking at the possible future as described by his father, can PM Lee and his PAP team handle the situation well? Do we have the confidence that the PAP can face the future? If not, PM Lee may claim that the one man’s view is just another Chinese Room Argument. From ‘Life after Cabinet…and death’, 11 Aug 2013, excerpts from ‘One Man’s View of the World’, Think, Sunday Times. Occasionally, when I disagree strongly with something, I make my views known to the Prime Minister. There was an instance of this when the Government was looking to reintroduce Chinese dialect programmes on free-to-air channels. I objected, pointing out that I had, as prime minister, paid a heavy price getting the dialect programmes suppressed and encouraging people to speak Mandarin. So why backtrack? I had antagonised an entire generation of Chinese, who found their favourite dialect programmes cut off. 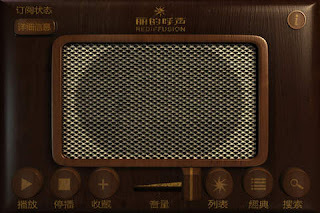 There was one very good narrator of stories called Lee Dai Sor on Rediffusion, and we just switched off his show. What we did not know about was the determination of one man to deprive grandma of her simple pleasures. 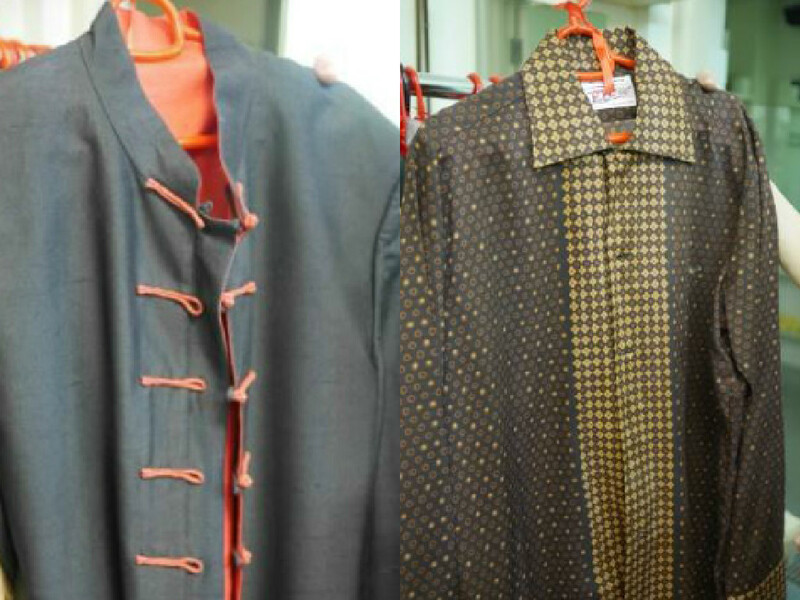 When filial elements in the Government were looking into reintroducing Chinese dialect programmes on free-to-air channels, Lee Kuan Yew put his heavy foot down. "I had antagonised an entire generation of Chinese, who found their favourite dialect programmes cut off.... Why should I allow Cantonese or Hokkien to infect the next generation? 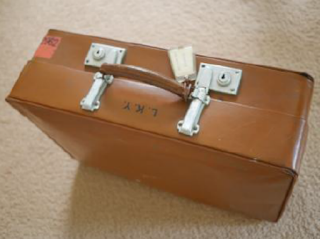 If you bring it back, you will find portions of the older generation beginning to speak in dialects to their children and grandchildren," according to his One Man's View. 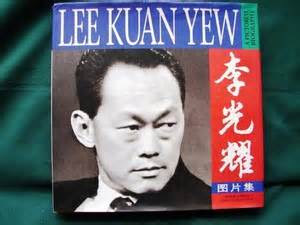 Apparently he's still sore Lee Dai Sor was more popular than Lee Kuan Yew, the man who "paid a heavy price getting the dialect programmes suppressed and encouraging people to speak Mandarin." Dude, suppression of any form is never popular in civil societies. A few loose thoughts on Lee Kuan Yew, who found himself in the spotlight again as National Day came around. Just to be clear, I haven’t read his new book, but have read snippets of it online. First off, I find it odd that Channel NewsAsia/TODAYonline uses the title “former Minister Mentor” to address Mr Lee, while The Straits Times and foreign media use “former Prime Minister”. The latter is more appropriate because it recognises the fact that he was once the leader of the country (not to mention the longest serving). What his last cabinet position was is secondary. Mediacorp, please take note. Just a few years ago, it was the “Hard Truths”. Now, a more humble sounding “One Man’s Views of the World”. Perhaps — just perhaps — this is acknowledgement from the man himself that he could be wrong sometimes? A very much subdued Lee at the age of 90 at this year's NDP. Totally in contrast to his younger gung-ho days. 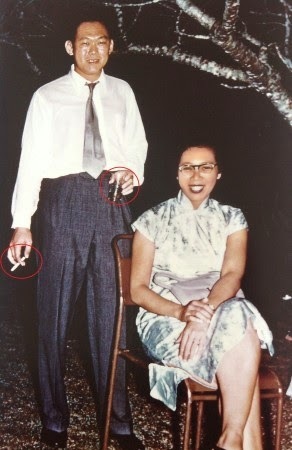 Q - What is the similarity between Lee Kuan Yew, Singapore's first PM and Franklin Roosevelt, America's 32nd President? A - Both had mobility issues at one time of their lives and both do not wish the public to see their clumsy locomotive skills. Q - What is the difference? He added that China would be active in pursuing its territorial claims knowing they are “the biggest boy in the neighbourhood”. Former prime minister Lee Kuan Yew on Tuesday described his latest book, which features his view of the world, as a "gathering of 90 years of various experiences". It is also a "largely unvarnished account with some of the rugged edges shaved off", said Singapore's founding father, who turns 90 next month. 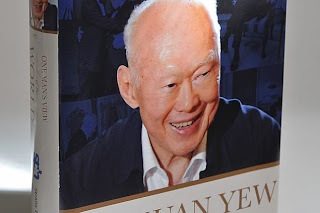 Appearing to be in good spirits at his book launch at the Istana, he quipped, to laughter from the audience: "I do not want to ruffle too many feathers." 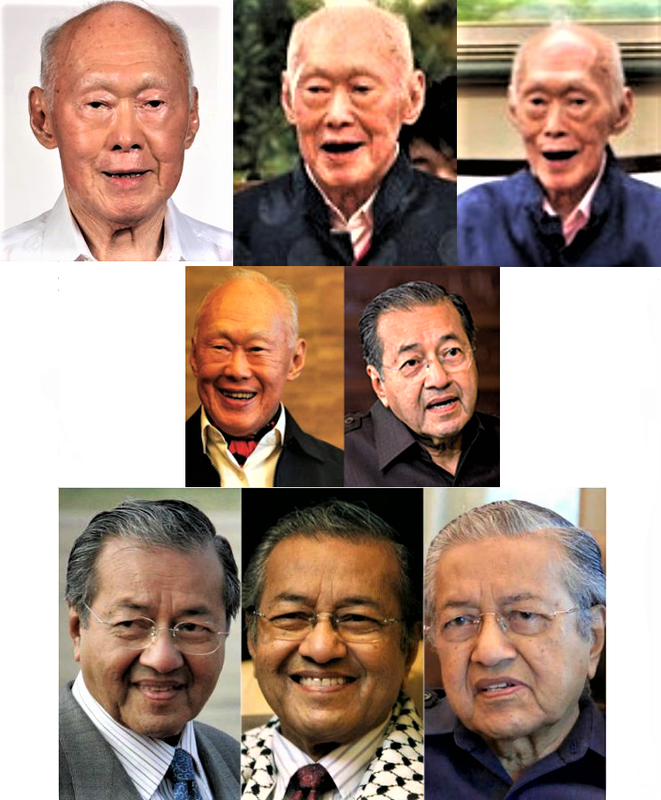 Former prime minister Mr Lee Kuan Yew said that while his views are "largely unvarnished" in his latest book on geopolitics, some of the rugged edges were shaved off. "I didn't want to ruffle too many feathers," said Mr Lee at the launch of his book on geopolitics "One Man's View of the World" on Tuesday. A new book by former prime minister Lee Kuan Yew will be launched on Aug 6. Titled One Man’s View of the World, the 400-page volume covers Mr Lee’s views on the future of the major powers and regions of the world. He also writes about the global economy and climate change, and reflects candidly on life and death. The final chapter of the book captures a series of conversations between Mr Lee and his old friend, former chancellor of West Germany, Helmut Schmidt. The two met to discuss international affairs over three days in May 2012 when Mr Schmidt was in Singapore. A team from The Straits Times provided research and editorial material, and conducted a series of interviews with Mr Lee. Excerpts of these interviews are included in each of the eleven chapters. You know credibility is at stake when the picture on the cover bears faint resemblance to the present day subject of another ghost written excuse to fill the book shelf. Asked why he would want to "write" another book, Lee Kuan Yew, 89 going on 90, said, "To recount what has struck my life before I lose my memory." The ghost writers, Han Fook Kwang et al says - unlike the earlier two volumes of memoirs, "Singapore Story" and "From Third World To First" - this 400-page exercise in ego massage focuses more on the future than the past. Lee must be the only person who has "memories" of the future. Artistic licence has just embarked on a new frontier. As in previous publications, Lee just can't resist insulting other countries, "The iPhone, iPad, Microsoft, the Internet - these were created in America, not elsewhere. The Chinese have many talented individuals compared to the Americans, but why have they not been able to come up with similar inventions?" The ST did an excellent job yesterday or was it Saturday introducing LKY latest book. Unlike Hart Truths, I think his book launching today is worth reading. Not that Hard Truth was a time wasting book, I feel that only some of the hard truths therein were hard and the rest were optional. "I cannot solve the problem, and I have given up..."
He can't solve it, the younger generation of leaders could? Even if they are more creative, which I doubt, who is going to carry this politically? In his new book 'One Man's View of the World', Lee Kuan Yew shares that he has given up on solving the problem of low fertility and also emphasised that money won't solve the problem. He suggested that if he were the prime minister, he would introduce a huge baby bonus which was equal to 2 years of the average Singaporean's salary. He expected that running such a scheme for 1 year would prove beyond doubt that even super-sized monetary incentives have only a marginal effect on fertility rates. He has “not turned out to be so brilliant”. 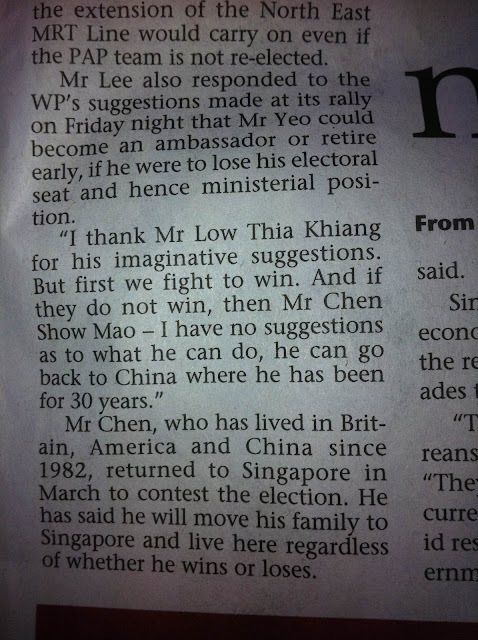 That’s what former prime minister Lee Kuan Yew said about Workers’ Party (WP) Member of Parliament Chen Show Mao. This line can be found in his latest book, One Man’s View Of The World (above). Mr Lee said in his book that Mr Chen disappointed in Parliament despite having stellar credentials. In an e-mail reply to The New Paper, Mr Chen said he hasn’t read the book, adding that it is “after all, but one man’s view"
Just what did LKY say about babies, women and Chen Show Mao? Time to buy another LKY book. The former Prime Minister is launching One Man’s View of the World today, which focuses on foreign affairs. Yet another book did you say? Haven’t we had enough books about the man or from the man? Well, ST (which is, again, the team behind the book) gave a pretty good blurb today about some of the stuff inside which has more to do with home than away from home. Lets put it this way. Not all the opposition parties are good but some of them are decent. Not all of PAP are lousy but some of them just cannot make it. Why can't the opposition be given a chance to prove themselves. I am sure you want to be given a chance to try to do something for your fellow Singaporeans. All we are saying is that PAP had their time and they didn't perform at their best and they didn't admit their mistakes till the very last desperate moment. What i can see from PAP's reaction is that they have finally woken up and know that they should be serving us Singaporeans and not the other way around. By giving the opposition a chance to prove their worth, we are also giving PAP a chance to once again prove to us whether they are really sincere when it comes to listening to us. If the opposition really cannot make it, PAP can always make a great comeback and show us they can really deliver. My personal view is that this gen of PAP is not like the old guards where they really went through hardships and put their heart and soul into running the country. That's why we are where we are now. Our current crop of PAP had gone through many elections UNCONTESTED and they are untested. So technically they are not proven success too. History has it when a new Kingdom is started, it is always great for the first 20-30 years becos they group that built the country will ensure it has a certain level of success for a number of years. When the old guards passed on, the new gen will be weakened if they are untested and uncontested (in terms of war), then complacency sink and slowly the structure will weaken and that is where dawn of a new era will kick in. We are at this point now. So lets bring in some decent opposition to track PAP and let the PAP be transparent and prove to us they can deliver at the highest level. Then we can have our good times back. Please remember opposition are Singaporeans too and they also have good interest for the country. Surely we don't want people from other countries taking over our beloved country. 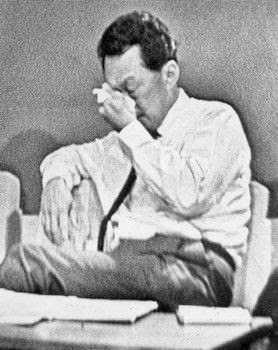 From time to time the former Minister Mentor Lee Kuan Yew had amused Singaporeans with his gaffes or his balderdash. 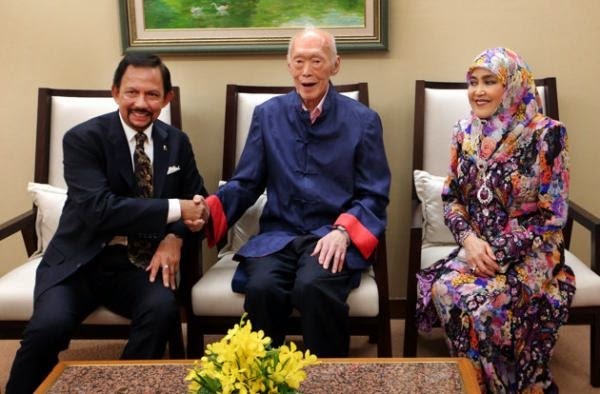 Quite often he prided himself with commanding the world audience with his so-called bombastic world view of politics but it is a different story with the Singaporean audience who view his so-called pearl of wisdom with cynicism except his die-hard supporters. 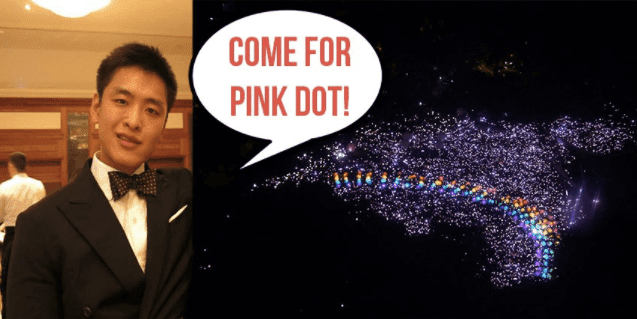 He likes to believe that he is popular with and liked by Singaporeans but he has only to surf the internet to see the kind of "tributes" that netizens heaped on him. Perhaps it would be an eye-opener to his loving daughter to surf the internet to see for herself the kind of uncomplimentary remarks on his eminent father before she extols his so-called virtues in her writings. These praises cut no ice with the discerning Singaporeans who have ceased to be mesmerised by his so-called charm. It has been his character to write books about himself, among other topics, in order to boost his standing locally and world-wide. In his latest book entitled One Man's View of the World, he had the impudence of commenting on the sensitive and much criticised subject of Singapore abysmal 1.2 fertility rate. He was the prime minister in the 1970s when he decreed the "Stop at Two" population policy and he now has the gall to say that the suggestion that his campaign of the 1970s played a part in bringing fertility rates down is "absurd". Lky said Chen Show Mao is nothing special... But then Pinkie how leh? In his latest book, former MM LKY had reportedly given his verdict that Chen Show Mao, despite his impressive credentials, has been nothing special as an MP. Since we are on this topic of post-election performance, I would like to ask MM what he thinks of his son’s LHL, and the other PAP MPs performance too. Lets start with his son, LHL. And let us do it the most objective way possible – over the last nearly 10 years that LHL had been PM, do you feel that you life has been better or worse? Do you feel more, or less, confident about your future? More importantly, do you feel more, or less confident, that your children will have a better future than you in Singapore? I believe that unless you are an Elite, most of you will feel less secure and more anxious. And I think the ruling Elites are beginning to realise that (err .. after almost 10 years of LHL’s era) – look at the slew of actions they are now taking to reduce the income gap, etc etc etc. In other words, LHL’s era had been a major negative for Singapore, not just “nothing special”. 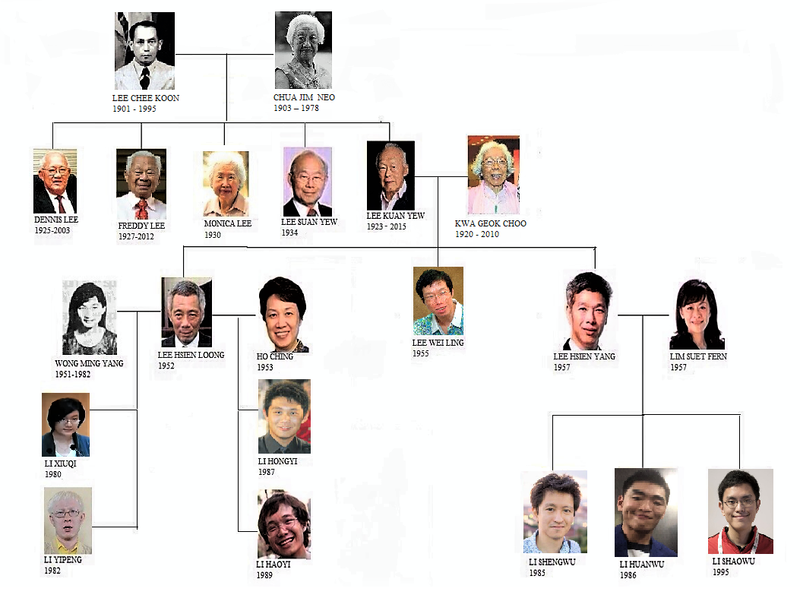 Maybe, when it comes to his son, former MM LKY cannot be objective?